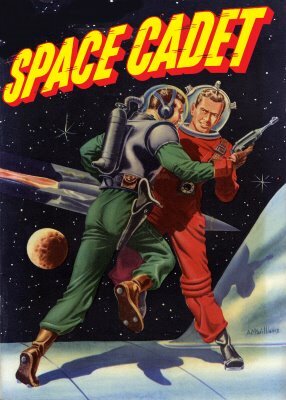 Hero Histories: Spend Christmas Protecting America in the Far Future with...SPACE CADET! Spend Christmas Protecting America in the Far Future with...SPACE CADET! You've come here because you want something different (but reasonably-priced) for your kitch-loving Special Someone this Christmas! Within our The Future WAS Fantastic!™ section are some of the niftiest sci-fi collectibles for the pop-culture fan, including Space Cadet! In the 1950s, the Tom Corbett Space Cadet tv series was to kids what Power Rangers are now; an incredibly-popular saga of teenagers banded together, using advanced technology to protect humanity from evil! The show was done live as 15-minute episodes, three days a week. Storylines ran from a week (3 episodes) to a month (18-21 episodes). The show ran on all four tv networks during it's original run! In order: CBS (1950), ABC (51-52), NBC (52-53), DuMont (the home of Captain Video, 53-54) and back to NBC (54-55)! There were also novels, comic books, a newspaper comic strip, and a couple of lp record albums featuring the show's cast in new audio stories! And, they were one of the first live-action tv shows to have their own View-Master 3-D reel sets! We've brought back the teen hero and his buddies in our own Space Cadet line of mugs, messenger bags, shirts and other goodies, all of which would make kool stocking stuffers or presents under the tree, especially combined with one or more of the books, dvds, or radio-show cds shown below! Plus: we've also done some toddler-level Space Cadet stuff like bibs, onesies/creepers, infant t-shirts, and diaper bags in our G-Rated Tykes, Toddlers & Tiny Tots (and Their Mommies)!™ section!